Our intention is for students to have the opportunity to get to know their area of choice in depth. At the same time participants will get to know young people from all parts of Spain and from other countries and will experience all that Valladolid has to offer from the cultural and social points of view. 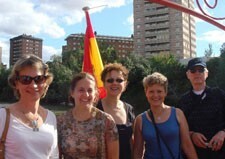 The Summer Institute will take place from June 28 to July 12, in the mornings. Each area of study offers many additional activities in the afternoons and at the weekend to make the most of our Region. 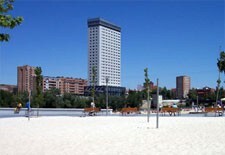 Lessons will take place in the premises of the Colegio Castilla y León, in single rooms. 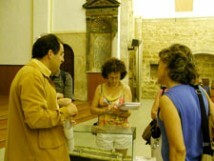 The Fundación offers participants a cultural and tourist information service to make the most of their stay. Please do not hesitate to contact us if you need more information. We look forward to welcoming you at the Institute this summer. The teaching of a second language can not be dissociated from the culture it belongs to. It is therefore important for foreign teachers of Spanish to have first hand knowledge of the Spanish culture and of the current and changing situation of the country. The program of this course aims to achieve this target. This is why we offer advanced language lessons together with sessions led by experts on a wide range of fields: art, governmental institutions, the media, religion in today's Spain, contemporary literature, architecture and changes in the Spanish society. The course will also offer an analysis of the most important events in Spanish history, as well as discussing techniques of interpersonal communication. Sessions will be led by experts, University professors and members of the pedagogic team of the Fundación de la Lengua Española. We offer a combination of intensive classes led by specialized professors, field visits, recreational and social activities, excursions to places of interest and attendance to the best shows of the Summer season in Valladolid and surroundings. Prices include registration, the academic program, excursions, common activities, materials for the activities, accident and health insurance, supervision and coordination. Accommodation in single rooms with bathroom in a residence with full board. All rooms have Internet connection. To book, you must download, print and complete the registration form. Once completed, please send the form, together with the proof of payment, by mail or fax to + (34) 983 37 52 96. If you have booked your accommodation, please send us the approval of the accommodation offer (this form is sent with the price information) and the proof of payment. Please access the method of payment section for more information. Participants will not be registered until appropriate payment has been received. Bank transfer to the following account: 2096-0201-19-3272844604 (IBAN: ES50-2096-0201-1932-7284-4604; SWIFT: CSPA ES 2L) addressed to the Fundación de la Lengua Española. The name of the applicant and the chosen dates must also be included in the transaction details. Bank transfer by Western Union or similar, addressed to the Fundación de la Lengua Española, Valladolid, Spain. To pay by credit card, please send the name of the card holder, full credit card number, expiry date and the security code (see reverse of the card) together with the application form. Applicants will be informed once their card has been charged. Participants who wish to receive an invoice must provide the necessary information for us to produce it. It will be delivered on June 28. Cancellations received in writing up to 15 days before the beginning of the Institute will be penalized with 25% of the total amount paid (registrations and/or accommodation). Cancellations received in writing less than 15 days before the beginning of the program will be penalized with 50% of the registration fee. The penalization for the accommodation will depend on their choice of accommodation.